Mike White has been at the forefront of Iowa’s resurgence as a grape and wine producing state. After beginning his career with Iowa State University Extension and Outreach in 1994 as a crop specialist, White became increasingly involved with the grape industry. He made the full-time move to grapes in 2007, becoming ISU Extension and Outreach’s first viticulture specialist. I work primarily with cold climate winegrapes, providing technical assistance to wineries and vineyards in Iowa and surrounding states. The type of assistance I provide can range from how to grow grapes, pest management, vineyard and winery equipment, marketing, cold storage, government and labor regulations, appraisals and winery location and design. Much of my assistance involves showing real world examples of what works and often referring clients to other experts with a specific expertise. I have the freedom to work on many problems over a wide area with a growing industry and a lot of great clients. The job never gets boring. And frequent wine tasting provides that extra special benefit! 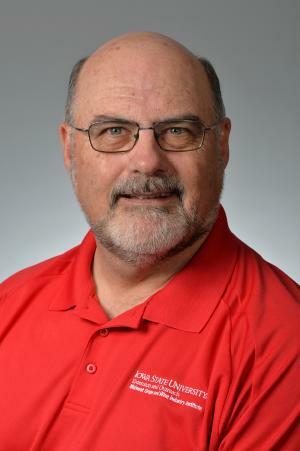 I graduated twice from Iowa State and worked closely with ISU Extension and Outreach while working in the agronomy service industry prior to joining the ISU Extension and Outreach team. Being so familiar with ISU made the transition very easy. Do you have any big upcoming projects or events? The Iowa State Fair Wine Experience centered around Grandfather’s Barn at the Iowa State Fair is the biggest annual event I am involved with. The Wine Experience was started in 2009 and has evolved into a very successful attraction at the fair. What is one thing you are especially proud to have accomplished in this position? The Wine Grower News, an online newsletter I started in 2007, has grown into an international newsletter with approximately 1,700 recipients in 40 states and 11 countries. This has dramatically broadened my client base allowing me to serve, learn from and find opportunities beneficial to Iowa and the entire Midwest wine and grape industry. I have an ability to “witch” tile lines, electrical lines, underground pipes and graves while holding two bent metal wires in my hands. I stumbled across this skill while working as a soil conservation technician in Mills County in the summer 1977. I have even used this skill to find unmarked graves along the Mormon trail and old neglected graveyards. I have a small Christmas tree and honeybee operation on my acreage in Indianola. My wife, Deb, and I have three married daughters and five grandchildren, all in Iowa, who keep us busy. I take some time off each spring and fall to help my daughter and son-in-law on their cow-calf, forage and crop operation in southwest Iowa. I enjoy serving as an assistant Warren County Soil and Water Conservation District Commissioner. We attend Hope Lutheran Church in West Des Moines on Saturday evenings and then go out to eat with a great group of longtime friends. It has become an end of the week tradition. I am part of a strong team that gets to assist 103 Iowa wineries and more than 270 vineyards covering over 1,250 acres grow good grapes, make good wine and grow a sustainable industry.